After my night in the snow, I was tired, cold and underslept. Every time I rounded a corner and saw the tiniest hill my mood darkened; my fingers and toes were very cold and I wondered about the risks of frost bite. I managed to crawl my way to Ovando, a small little town with a population of 50+; people come from all over the world for the fly fishing at the famous Blackfoot River. I found the local place to eat, Trixies, and was pleasantly surprised by a very tasty meal which instantly lifted my spirits. Sue and Leroy started talking to me at the bar and very generously offered me their cabin which completely reversed my mood. With the temperature hitting below minus 10C the idea of camping wasn’t looking that appealing and their cabin was fantastic. 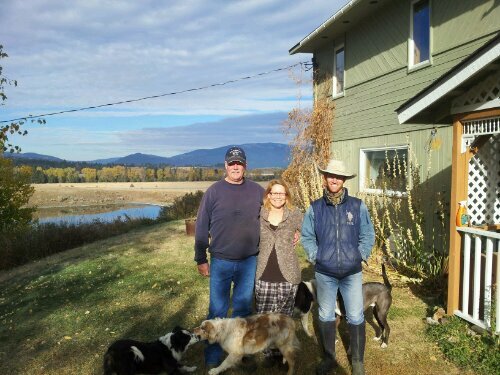 Sue and Leroy; don’t mess with the horns… They run a fly fishing river shuttle business that thrives during the summer; then they have six months off when business dies off with the onset of winter. Nice. 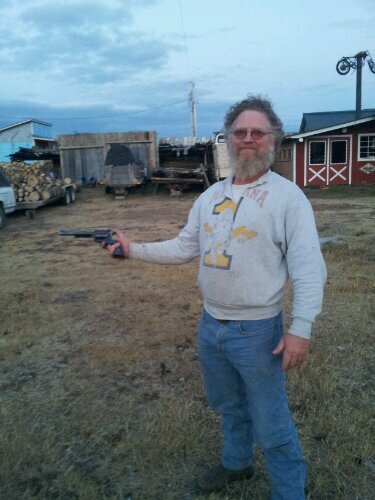 We had time to kill so Leroy took me into the garden and we shot off a couple of rounds to pass the time. 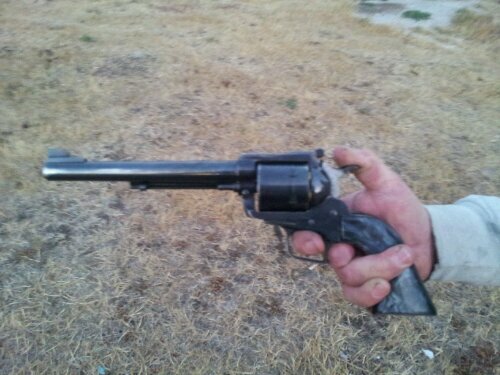 .44 magnum, famously used in the film Dirty Harry. This gun packs a punch and is deafeningly loud (my left ear was ringing a few days after). I’m told it’s one of the few pistols that can take down a bear. 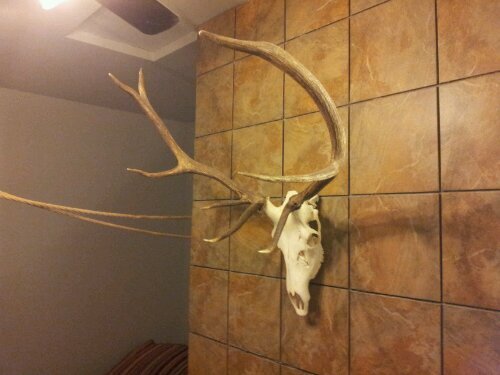 An unfortunate elk stag that met his match with Leroy. It took several hours and numerous shots to bring him down; having to finish him off in defence with his .44 as it stood to make one final surprise charge at him. 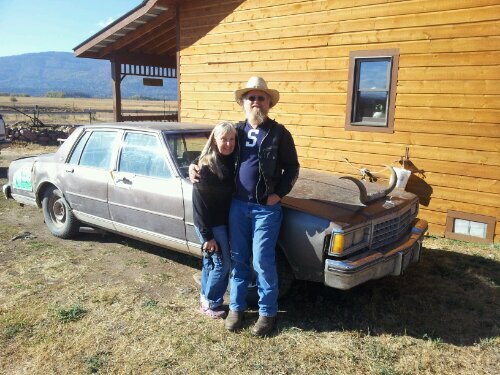 Any game is eaten over the next year; Sue and Leroy hunt for their food and don’t waste any of it. The next day I felt a lot better but I was still fatigued so the cycle over Huckleberry Pass to Lincoln was hard work. Sue and Leroy had suggested I swing by the Montanan for it’s famous buffalo burger; they knew the owner Barbara. After an impressive meal, Susie who worked behind the bar very kindly offered me a place to stay; it was going to be another very cold night so I snapped up the offer immediately. This black bear (that was brown) was shot by Rick (Susie’s husband). 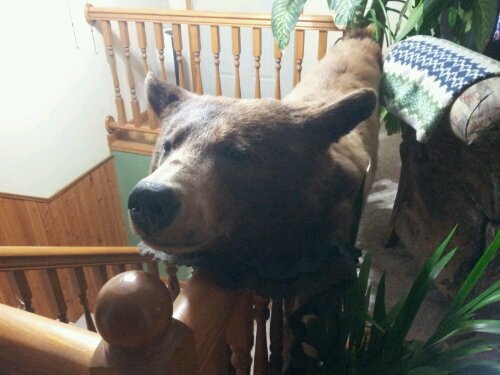 Having had my tent ripped up in Alaska by the same type of bear, I wasn’t that sad to see one hanging over the bannister. 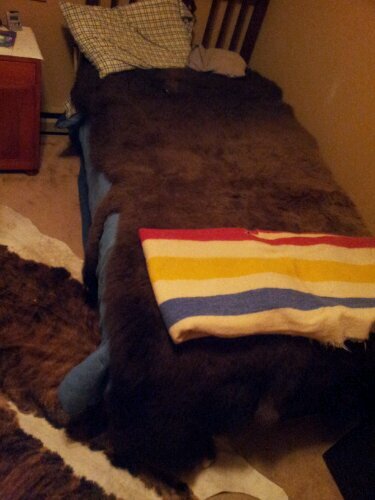 My bed for the night: with the standard buffalo hide for those cold nights; note the tail hanging over the end. Susie, Rick and Josey: awesome people. Sent me off with some extra winter clothes and a great breakfast that powered me across nearly three Continental Divide crossings later that day.